Have you ever said, "I am really great in a crisis!" You recall rising to the immediate challenge with the best of yourself. The question posed by The POWER of URGENCY is, "Why wait for a crisis to be at the top of your game?" The author describes how to use the amazing strength, creativity and boldness you discover through your reaction to a fight-or-flight situation, and do it proactively when and where you choose. As a business leader, entrepreneur, or anyone ready to change the status quo, learn how to create from the best of yourself by being urgent in pursuing the objectives most important to you. From the introduction by Steve Chandler: "This book first makes the point that the power of urgency is known to all of us. We can reference it. We have all had situations wherein we had no time to think and plan, where we simply had to respond with the highest energy we had. Later we basked in the afterglow of amazing results. This thought rose up: Hey I didn't know I had it in me. Then, maybe years later, it would happen again. Emergency-level crisis and massive, inspired personal action taken in response. Usually extremely bold and surprisingly clever. Remember those rare moments? But, as Will points out here, these events are all driven by external circumstances. We are challenged. We have nowhere to hide. We respond. But what if we could turn this ability on and off by making a proactive decision to engage it? What if we could bring the urgency with us into situations of our choosing? What if we could elevate our consciousness into that supermind state we're all so fleetingly aware of? That's the lightning in a bottle that's been caught here for everyone to learn to use. On a daily basis there are things that come up that are or may become urgent in nature and the energy that surround this and what gets done in this time is what this book is all about. How can you capture this energy and sense of urgency and instill this in everyone around you? This is not an easy task but this author does a great job at laying it all out for the reader, helping them to better understand the complexities within and what you need to do to be able to encourage this more too. 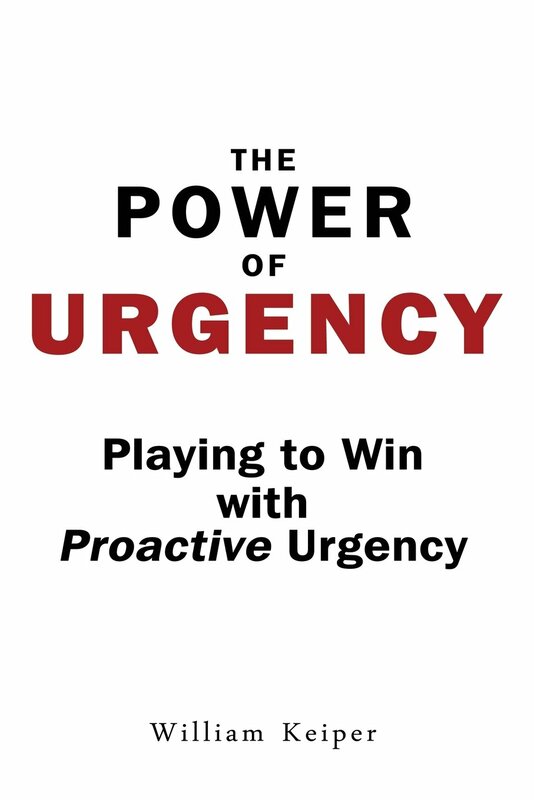 What the author has done here is provide anyone who reads this a roadmap for success, as I have always found that when there is a sense of urgency set into place with the people around you, you will achieve more and this book does just that. Though the book is short, you gain so much from it. I found that after reading it the first time I picked it up again as I wanted to make sure I grasped all of the concepts and you will also!